Happy Friday morning to you! I hope this finds you warming up with a cup of coffee as you settle in for your day. We've had a great week, and I've got a few photos to prove it :) The boys and I don't have much planned for the weekend, but I'm excited to check out "Fuller House" tonight on Netflix! The other day, the sun was shining perfectly into our dining room as the boys had their snack--so I had to snap a few pictures. On Saturday, we drove to my cousin Dayna's house to meet her three-week-old baby boy. He is so precious and tiny, and I immediately fell in love. We went to Chick-Fil-A with Dayna, her three kids, and my Aunt Sally for lunch. Then we ventured over to a really fun park. The weather was just gorgeous--a high of 67! It was quite windy, but we got the fresh air we all so definitely needed. Aunt Sally spoiled the kids with popsicles out on the porch. Catching one more moment with the baby before we had to say goodbye! On Saturday night, I made a loaf of blueberry poppyseed bread. Mmm! I didn't get to enjoy very much of it though because I had an unfortunate stomach bug on Sunday. On Sunday, Ephraim and I hung out in the nursery at church. He likes to conduct this train and shout "choo choo!" Working on some meal-planning and new recipes! Yesterday, Nolan and I had dentist appointments with a new dentist. Ashley Graham was being interviewed on "Ellen", which is so surreal because I graduated high school with her in Nebraska! She looked beautiful. She's currently on the cover of Sports Illustrated Swimsuit Edition. Nolan totally impressed me by staying still and not squirming during his appointment! This was the first time he's gone to the dentist for a real cleaning and not just a peek into his mouth. The hygienist was wonderful with him. She made it all fun, but kept things calm. Snowy Thursday afternoons are for baking! Ghirardelli has a really delicious dark chocolate chip cookie mix. Makes things easy! Steve had a snowy commute home, so we were happy to see him at 8. We gave him hugs, and the boys fell asleep as soon as their heads hit the pillows. P.S. 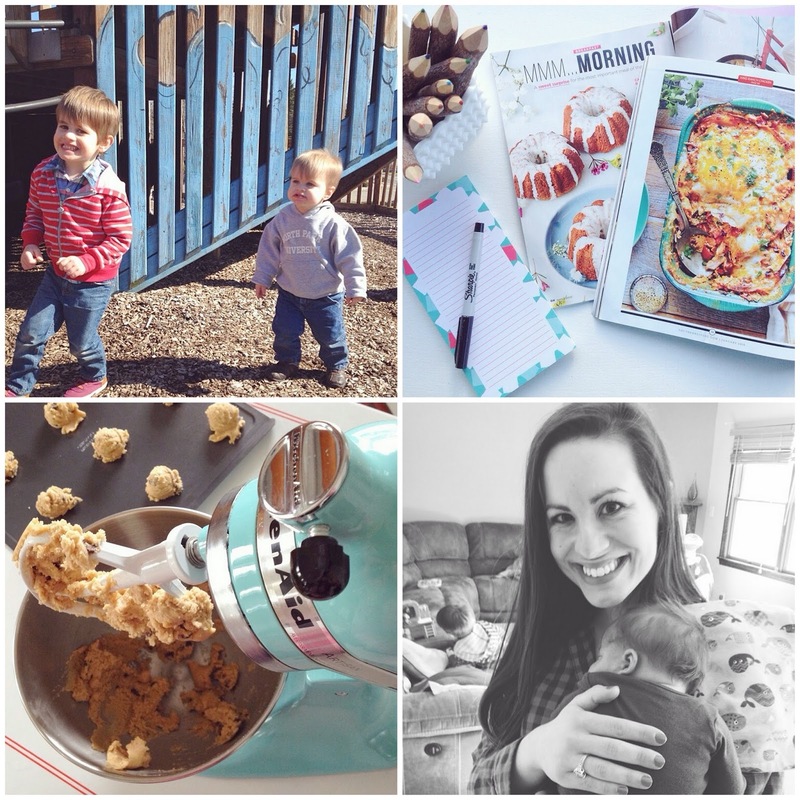 Astleigh and I are hosting an Instagram challenge throughout the year. Each Monday a new theme will be given. During the week, post a photo that gives your take on the topic. Get creative, get colorful, get unique! And on Fridays we'll pick our favorite and share it on our feeds! You in?! We'll be sharing next week's topic on Monday. And you've still got time to post a photo for this week! The theme is "Current Reads." When we moved into our 1920 abode, the first floor bathroom left much to be desired. The tiny afterthought of a powder room is tucked underneath our second set of stairs (the "servants" stairs) between the kitchen and the living room. There were many issues with the bathroom. First of all, the red linoleum floor was partially torn up, and the entire floor reeked of cat urine because a litterbox had been in the room for so many years. Second, the toilet leaked into the floor, causing the floor to buckle and the toilet to lean to one side. Third, the stucco yellow paint was peeling and cracking everywhere, revealing years and years of paint color changes. And fourth, the sink was so close to the toilet that you could use both at the same time. Not only that, but you could barely fit between the sink and the door if the door was closed. Yikes! The red linoleum is the same as our kitchen floor, and it continued on into the hallway and the bathroom. I basically avoided using this bathroom for two years--it was just too small. To begin the renovation, Steve tore up the linoleum in the hallway and the bathroom. He sanded and stained the hardwood floor in the hallway to match the rest of the house. The blue sink really only left about four inches for a person to fit between it and the closed door. It also leaked, thus the container on the floor to catch water. Steve tore out the heating duct on the far wall (it traveled through the bathroom to heat the stairs). He cleaned up the floor, pulling all the nails and staples in preparation for hardiebacker (cement board). For the toilet, he installed a new PVC toilet ring (flush with the new floor) so the new seal wouldn't leak. When we picked up our new corner sink at Lowe's, we were excited to see how much smaller it was than our blue sink! Hardiebacker is installed. Planning the floor tile! Because our local store doesn't typically stock all-white tile, we used the black-and-white and replaced the black tiles as we went. Steve took down the two giant side-by-side mirrors, revealing gross globs of brown glue and ancient pink paint. The blue sink left big craters in the yellow stucco paint. Steve replastered the walls and ceiling until they were finally smooth. This took several days. Then, he painted the whole bathroom a bright shade of white to lighten up the space. He cleaned all the old paint off of the wood trim, restained them, and reintalled them. From there, he installed the new sink and faucet, and a new light fixture (all from Lowe's). Last week, we bought a mirror from Walmart for only $25. It's the "Better Homes and Gardens Vintage Luca Mirror". Here is the final transformation! We gained so much space with our tiny corner sink! 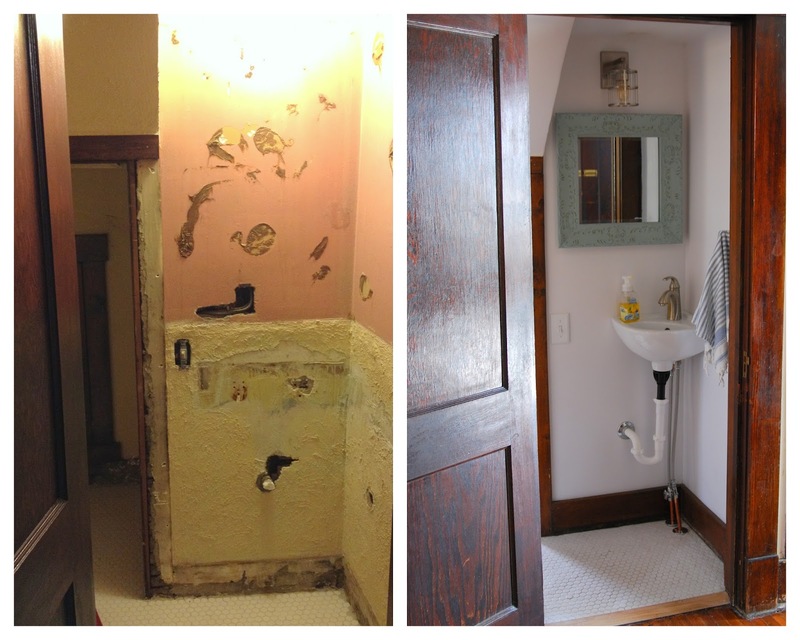 Have you redone a small bathroom like this before? I'd love to hear. We had a low-key Valentine's weekend. Lowe's had a "Build and Grow" workshop to make Valentine's picture frames. It was only 3 degrees outside, but we always have a good time at Lowe's. This was Ephraim cuddling up next to Daddy during a "scary" part of CARS on family movie night. I made this Black Bean Salsa for Ephraim's party a few weeks ago, and I couldn't wait to make it again. It's not easy to get me to eat beans and vegetables, but this is so delicious! Mix 1 cup of apple cider vinegar and 1/2 cup of sugar. (You can add 1 Tablespoon cayenne pepper if you like extra spice.) Pour over the veggies. Chill, and serve with Tostitos Scoops. P.S. 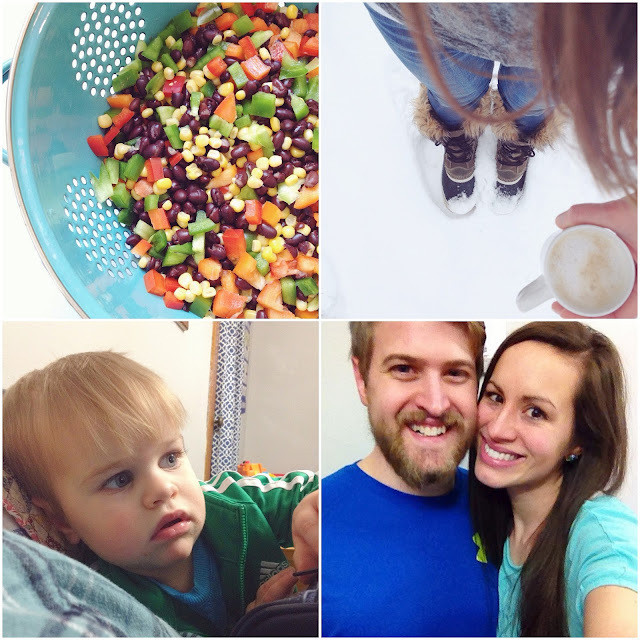 Astleigh and I are hosting an Instagram challenge throughout the year. Each Monday a new theme will be posted. During the week post a photo that gives your take on the topic. Get creative, get colorful, get unique! And on Fridays we'll pick our favorite and share it on our feeds! You in?! We'll be sharing next week's topic on Monday. And you've still got time to post a photo for this week! The theme is "Winter White." Anyone can join in!